More than 2,000 Americans sustain eye injuries while at the workplace every year, with nearly a million experiencing vision loss to a certain degree because of work-related eye injuries. With all these factors considered, it is important that eye safety measures are observed in the workplace. 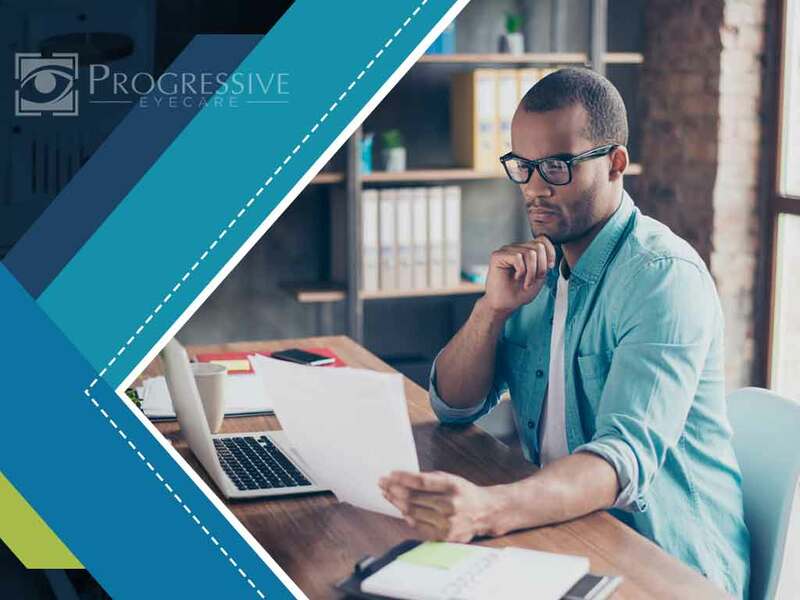 As we observe Workplace Eye Wellness Month this March, Progressive Eyecare, your provider of quality eyeglasses and other eye care services, discusses common workplace eye injuries and basic first aid measures, and shares some tips on preventing eye trauma while at work. According to the National Institute for Occupational Safety and Health (NIOSH), construction workers have one of the highest eye injury rates. They also experience some of the most serious ones. In fact, a simple corneal scratch from sawdust can cause serious vision problems or even blindness. Your eye doctor shares that sanding, grinding and masonry work may produce tiny particles that may get in your eyes. Hammering on metal, which can shed off metal slivers and cause nails to rebound, is one of the most common causes of eye injuries among construction workers. Exposure of your eyes to wet or powdered cement may lead to chemical burns. The same goes for scientists and lab technicians who frequently come into contact with chemicals. Welders, on the other hand, are often exposed to flashes that emit high ultraviolet radiation, which may also cause vision problems. Your optometrist explains that chefs, cooks and kitchen helpers are also at an increased risk of sustaining eye injuries at work due to working with hot oil that can splatter. Athletes are at risk too, particularly those involved in contact sports like soccer or basketball. You might think that an office job, or a career that would mainly require you to sit behind a desk and work on your computer all day, would be your safest bet when it comes to avoiding workplace eye problems. But this is not always the case. While chances of sustaining eye injuries are low, you are at a higher risk of developing computer vision syndrome. Also referred to as digital eye strain, this condition is marked by visual discomfort after working on a computer, laptop, or any other digital device for an extended period. Your eye care specialist explains that your eyes may feel heavy and tired. They may also become red and watery later on. Undetected and uncorrected vision problems can further increase your risk of sustaining eye injuries at work. This is why it’s important to have your eyes examined by an eye care specialist on a regular basis. Eye exams are usually included during routine employee physical exams. Observe your workplace carefully. Inspect the workspace, the table you’ll be working on, and even the access routes. You can also study eye accident and injury reports and identify which operations or areas present risks. Awareness is key to preventing eye injuries as you work. If there is none yet, create an eye protection program in your workplace. You can ask help from a trusted eye doctor on what measures or tips to include. This can create awareness about eye safety hazards on the job. You can also suggest including workplace eye safety in your employee training programs. Make sure that you and your co-workers are wearing safety goggles whenever you’re working in a hazardous situation. Select protective eyewear that’s specifically designed for the hazard you’ll be facing. Polycarbonate lenses are a good choice; they are made of durable and impact-resistant materials that can withstand high levels of pressure. This means they are less likely to shatter even when subjected to a strong force, such as a forceful elbow blow to your eyes. Protective eyeglasses or goggles with side shields are helpful too. They can prevent debris or dirt from entering your eyes through the sides or under your eyes. If your job entails lots of computer work, make sure to rest your eyes regularly. In particular, we recommend that you practice the 20-20-20 rule: for every 20 minutes of work on your computer, look at an object 20 feet away for 20 seconds. Should you sustain an eye injury while at work, do not panic. Go to the nearest eye clinic or hospital as soon as possible. If you cannot move, have someone call an ambulance immediately. Wearing safety eyeglasses can help prevent further trauma to the affected eye. Before the ambulance comes, or while en route to the emergency room, do not rub or put pressure on your eye. If a foreign particle has become lodged in your eye, do not scratch it. Doing this may cause corneal abrasions, which may worsen your condition. Avoid self-medicating as well. There are some drugs that may increase bleeding, which may cause much bigger problems. Do not attempt to apply or remove contact lenses, soothing eye drops or anything else from the affected eye. The best thing you can do is to seek an eye care specialist’s advice or medical attention as soon as possible. To learn more about workplace eye safety, contact us at (702) 744-8005 for North Las Vegas, (702) 723-4888 for Boca Park, or (702) 357-8202 for Southwest Las Vegas. We serve NV residents in Summerlin, Las Vegas, North Las Vegas, Southwest Las Vegas and other nearby Nevada communities.